The largest cruise ship in the world. This sleek and modern fine dining restaurant serves everything with class and elegance. From the martinis made table-side to our delicious seafood dishes, it was all high quality and mouthwateringly good. We could eat seafood everyday - especially the seafood at Hooked! From their “Messy Fish Sandwich” to their famous Surf and Turf, everything is fresh and delicious. Plus as style and design goes, this was hands-down our favorite restaurant. We like to refer to the style as “Nautical Hip”. Who doesn’t love a good Hibachi show?! We left this specialty restaurant with full bellies and sore smiles - we laughed the entire night! Everything we had was awesome (make sure you ask for the “Yum Yum Sauce”) and the people we sat with were a blast too. Definitely one of the highlights of our cruise! This is where robots make your drinks. For real. It felt like we were living in some futuristic sci-fi movie, in the best kind of way. And heck, if that’s where the future is headed, we’re totally fine with it. These robots know how to make tasty drinks! This bar rises and falls with the tide… Ok, not really - but pretty close! This moving “wet elevator” takes guests from The Royal Promenade up to Central Park. It was our favorite spot to sit and people watch - and they also made some of the best chocolate martini’s we ever had! This “AquaTheater” show was by far the most jaw-dropping, as it featured acrobats performing stunts in the air and in the water that are both unexpected and mesmerizing. Performed on ice (yes, ICE! ), this mystical and eye-catching show had us in total amazement. Go early and grab a seat closest to the rink, as being so close to the ice skaters was one of our favorite parts. We’re big musical buffs, so we were real excited when we saw that they were performing Hairspray on board. Little did we know just how epic the show would be - from the sets, to the songs, to the broadway talent - it’s phenomenal. We’re still singing the songs! This musical chronicles aviation milestones throughout the years, and they do so in an energetic and inspiring way. The sets and the dance moves will have you in awe. 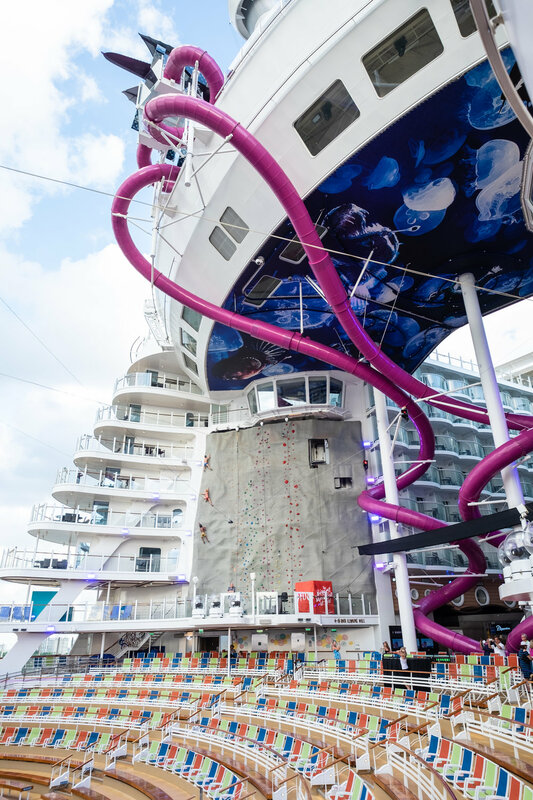 This ship also had something called “The Ultimate Abyss” - a dry slide that happens to be the tallest (and in our opinion scariest) ride at sea. It plummets riders 10 stories down… and it’s an absolute blast. Ride it at night for the ultimate thrill. They have a flowrider. Actually 2! So you can surf while you’re out on the open seas. Unless you have done it before, it can be difficult to figure out how to stay balanced. So take it slow. It may be a good idea to start with bodyboarding before attempting to surf. Bobby could’ve spent most of the day pretending he was back at home surfing his local spot! 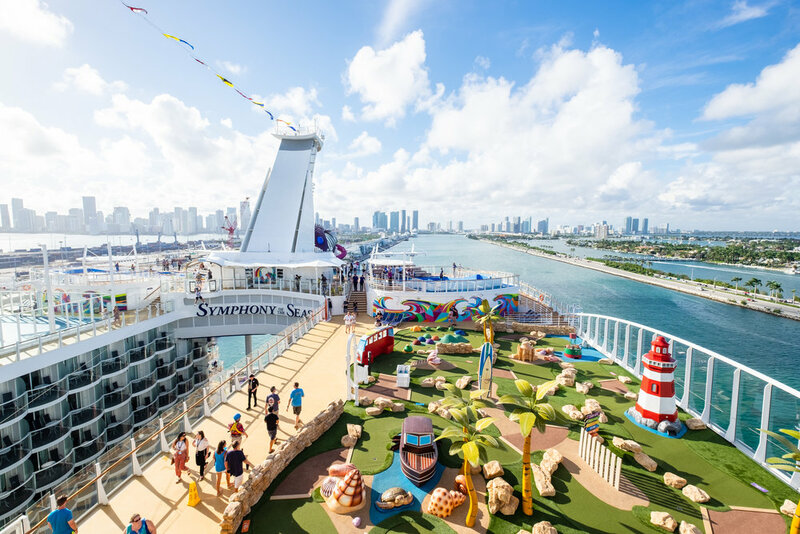 We love a good Escape Room, and the one aboard the Symphony of the Seas will definitely have you scratching your head and scrambling to figure out clues. In this adventure game you have 50 minutes to “escape” and solve the problem. We won’t give too much away, but we WILL say teamwork and communication is key. Yes. A silent disco. Where you show up and are given a pair of headphones, and walk out on the dance floor and dance your face off. When you need a break (and a laugh), take off your headphones and listen to the awkward world of a silent disco sans-headphones. 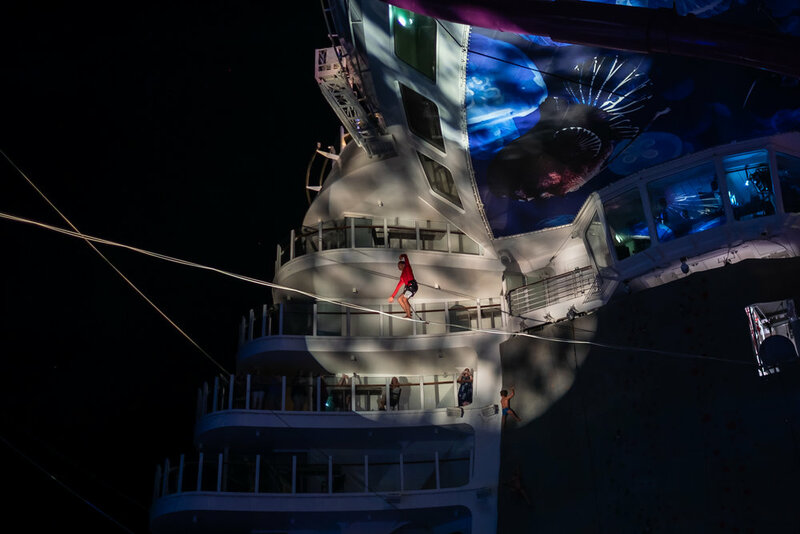 No big deal… just the world’s tallest zip line at sea. Nine floors above the Boardwalk, it’s definitely high enough to get the adrenaline pumping. Definitely a must-do! While this is a small snapshot of the Symphony of the Seas, we hope it gives you a glimpse as to how phenomenal this ship really is. Yes, it’s the largest cruise ship in the world - but it’s so much more than just a big ship. It’s fun, it’s inspiring, it’s a visual masterpiece, the staff feels like family, the food is top-notch, and the experience and memories onboard are priceless. Book a trip. And pack us in your suitcase.